There are many schools of thought regarding what colors to include on your palette. I am keenly aware of the fact that most artists have precious little money to spend on supplies, frames, etc., but the truth is that if you starve your palette or skimp on cheaper student-quality paints, you will cause yourself more frustration for the money you save. Student quality paints typically have more filler, oil and less pigment per volume, which means weaker tinting strength and consistency. If you are going to paint, you should really invest in quality supplies (paints, brushes, and grounds on which to paint). In the long run it will be worth the sacrifice. Every student should experiment with colors that appeal to them, and then make charts to develop an understanding of how those colors will react when mixed. Below are the colors I highly recommend. Note: The thumbnail images below have nothing to do with the actual colors. They are simply a generic tube from that brand. The links will take you to the correct page for each color. Particularly in plein air painting, you will use more Titanium White than any other color you buy. Don’t bother with small tubes, you’ll just be throwing away money. Larger tubes are more portable than pint sized cans, and are economical enough to be worthwhile. I prefer Grumbacher’s Soft Formula Titanium White. It is easier to mix, particularly in colder weather, and has excellent brightness and colorfastness. Cremitz and Flake White are lead-based pigment. Care must be taken not to ingest this type of pigment, nor inhale particles if you sand it, however for Artists, this is relatively benign. The reflective quality and warmth of this type of white is unparalleled, which is why this makes for a great, albeit expensive primer. Fewer paint makers are producing this pigment any longer, because of our government’s regulations on lead-based paints. If you’re serious about portraiture, this pigment is a must. Winsor & Newton Artists’ Oil Color is unmatched for its purity, quality, and reliability – a success that is reflected in its worldwide reputation among professional artists. Sets also available. There are several Reds that I use, each has its place on my palette for different circumstances. In plein air painting, I prefer highly saturated colors that can be used to modify earth colors, blues and yellows. In portraiture, I prefer colors that cool as they are tinted. 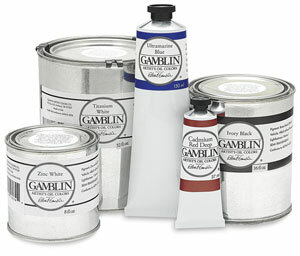 Gamblin Artist’s Oil Colors are crafted by hand with the well-being of artists, their work, and the environment in mind. They combine the best traditions of the past with the latest technical innovations, giving you the freedom to create without compromise. The only one Orange that I purchase already tubed is Mono Azo Orange. I tend to mix my oranges, but make an exception due to the nature of this particular pigment. Mono Azo Orange is a very bright, highly saturated orange that quickly cools when tinted with white, which is excellent for skin tones. When mixed with Cadmium Yellow Medium, it is close to the bright color of construction signs. Asphaltum is without a doubt the second most important color on my palette. It is a mixture of Mars Red and Black. It is a semi-transparent color that dries relatively quickly and for that reason makes for an excellent lay-in color. It ranges from a pale, warm umber wash to an almost black dark. I combine Asphaltum into almost every dark I mix, for accents, and use it with blues to create excellent grays. Terra Rosa and Venetian Red are both very similar colors, highly saturated, semi-transparent, and they also make for excellent monochrome studies. Venetian Red is the cooler of the two. I use three Cadmiums, Naples Yellow and two additional colors in this range. Gold Ochre is a largely transparent color almost identical to Yellow Ochre, but capable of darker undertones. For this reason the range of colors you can mix with it is wider than Yellow Ochre. Raw Sienna I group with my yellows, although it is an earth color, as in my mind, it works like a deep yellow. Naples Yellow Deep is an opaque yellow which I use rarely, that can be useful in cityscapes. I have three greens on my palette, two I use all the time, the third only in special occasions. The first is Gold Green, a transparent hue that adds a great deal of warmth to any mixture, and becomes more definitely green with the addition of white. The second is Viridian, which is the basis for most of my greens in landscape painting. This can also be used to cool off skin tones in portraiture. The last is Pthalo Green, which I occasionally mix with white for a subtly saturated sky. There are two blues that are always present on my palette and those are Ultramarine and Cobalt Blue. I use these more than any other, in addition to Blue Black, both in landscapes and in portraiture. I also keep a tube of Prussian Blue with me in the event I need a deep, saturated, cool blue, and occasionally I will also use pthalo blue, greatly tinted (effectively becoming Cerulean Blue), to saturate a bright sky. I do keep one Black on my palette, and that is Winsor & Newton’s Blue Black. Although I’m not one who believes that you should never use black in a painting, I find myself more often using this color to modify yellows to mix greens. It is excellent in that regard. There are two colors that I primarily use in this range, they are Dioxanine Purple and Cobalt Violet. Dioxanine is an excellent strong tinting purple that I often use to modify yellows and create rich darks. Cobalt is a very weak tinting color that is better used for subtle modifications, such as in skin tones. It is also the more expensive of the two.